Make sure your users have a reason (and are able) to come on the app as often as possible. Dries Depoorter, on the other hand, is evidently trying something different. Depoorter is the co-developer of an app called ‘Die With Me’. 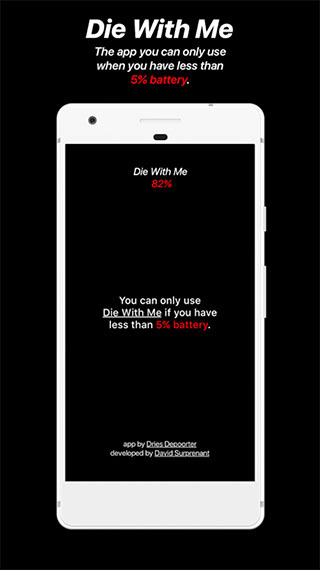 A chat app, ‘Die With Me’ comes with a catch — you can only use it when your phone’s battery is under 5%. When you do reach that sweet spot, you can launch the app, and chat with other people who are also in the same situation (battery wise) as you are. On the app’s website, Depoorter says for the app, “Die together in a chatroom on your way to offline peace.” Having made the app available for both Android and iOS devices, I think its pretty safe to say Depoorter doesn’t care what device you’re using as long as its about to die on you. I have not tried the app out for myself, and I’m not recommending that you guys try it out either. However, the app almost has an air of enigma around it. I mean, does it actually only work with less than 5% battery (it should, because that’s the claim)? Does it match you up with random people, and if so, how are those people chosen? Can you search for users? Can you even be sure you’re talking to a human being and not just some AI? Questions that probably don’t need answers, but still questions that bug me. However, the app is priced at ₹75 (0.99 cents), which is definitely not something I’m willing to shell out for an app I’ll probably never use. The questions may bug me, but paying for an app like this will bug me even more. That said, even if the developer doesn’t really intend to make money off of this project, the idea certainly is intriguing. I mean, Rupesh’s phone is so often dangerously low on battery, it’s almost as though it is perpetually stuck in a loop of 2% to 5% of charge; which kind of makes this the perfect chat app for him. Maybe I’ll get him to shell out the ₹75, and let you know how the app fared.